Just thought I’d post some updates on my Papercrafting since I’ve been silent for a while. If you’ve been following my comments on some of my previous papercraft posts (Bulbasaur and Charmander, Squirtle, Tepig) you know that I’ve had Lapras in progress and that I’ve been planning to make a Mewtwo. I got Lapras done enough to display at our local Anime and Videogames convention, AVCon. It had everything except the flippers – a pretty good effort for a couple of weeks solid work, I think! 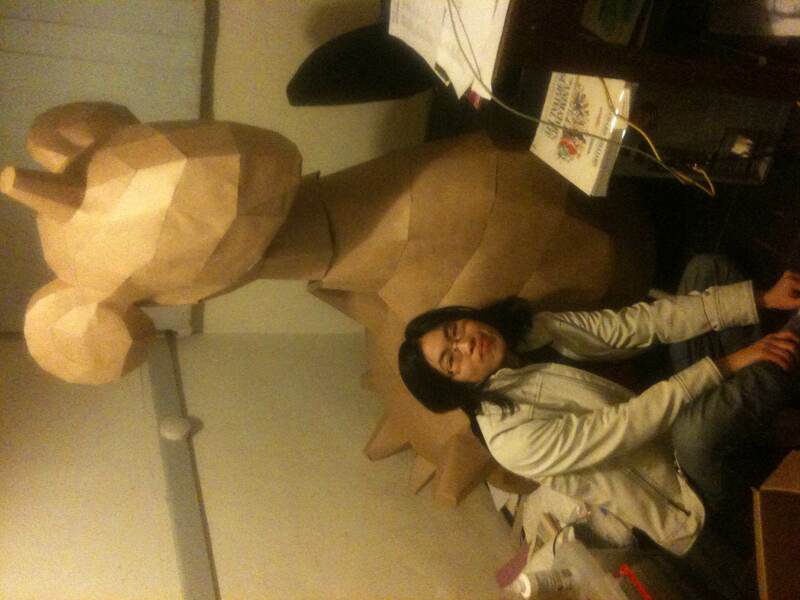 Since AVCon I actually haven’t picked up the Lapras parts again, so I haven’t been able to finish it off. I guess my interest has waned since I solved the major engineering problems involved in getting the head to stand. Here’s Lapras with me for scale. This was taken the night before AVCon. At the time I honestly didn’t know if it was going to work – getting the head to stand was a huge triumph. When I wasn’t supervising the models, some kid crawled inside Lapras! You can see his legs through the side of the model. As for Mewtwo… in December last year, pokemonpapercraft.net released a Lucario model, which I decided might make a better subject for my first attempt at a bipedal Pokémon. 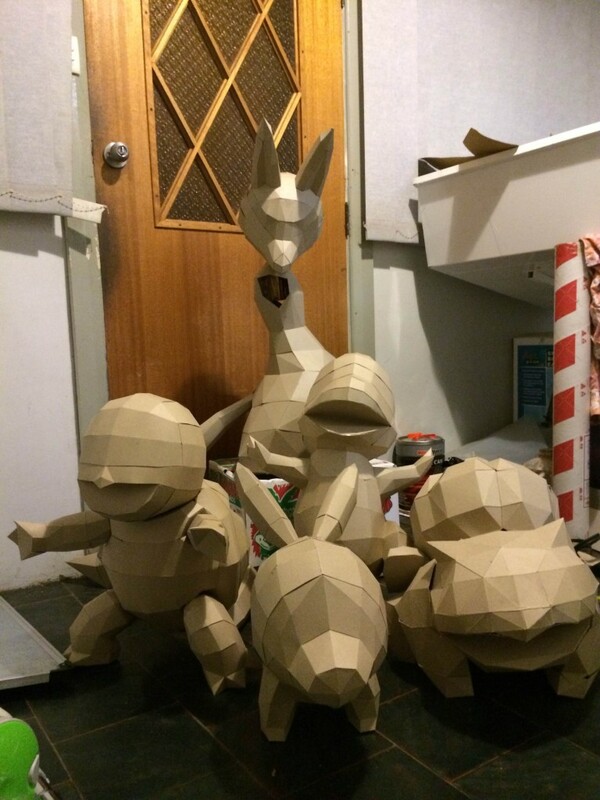 For a start, the finished model would stand at about half of Mewtwo’s size (1.2m vs 2m). Its smaller size also meant that each piece that I cut out would quite nicely fit on my cereal box cardboard, which is much nicer to work with than the cardboard that I used for Lapras. And in general, Lucario’s limbs are much less intricate than Mewtwo’s. 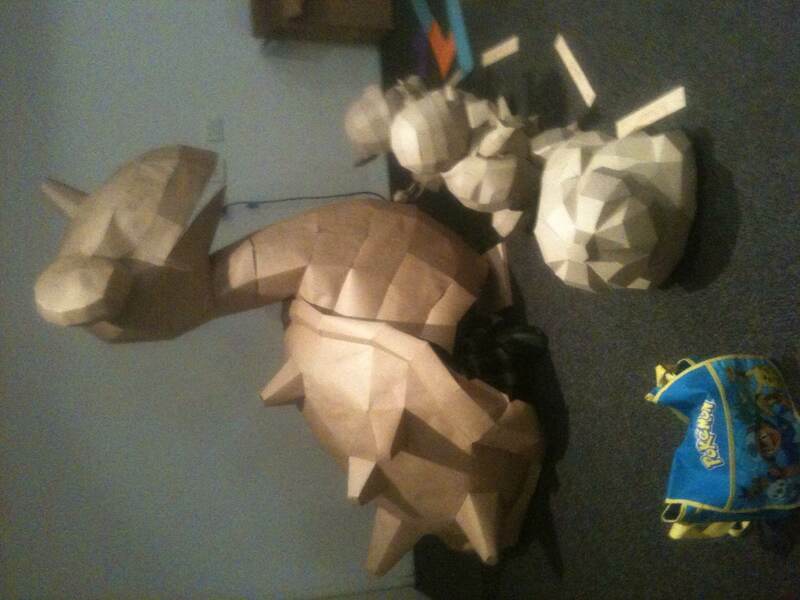 Over the Australia Day long weekend (exactly two years since I made Bulbasaur!) I got most of Lucario assembled. He used about 24 cereal boxes worth of cardboard… after saving up my housemate’s cereal boxes for a year I’m now almost completely out of boxes! Here’s an in-progress shot of Lucario. I’ve been working on making this one in modular parts that can be slid in and out of the model. I learned from Lapras that if something is going to be big, or if you’re not sure about how the pieces are going to fit, it’s easier to deal with things if they’re in their own pieces. If you need to remake something, then you can just remake a single piece instead of having to take apart the whole model and potentially start from scratch. I hope to finish Lucario off soon – since these photos I’ve already completed his arms, tail and legs – just the hair bits to go! I haven’t been planning to paint them so far, as I like the polygon look to them. Someone just suggested painting them in flat colours, which would preserve the polygon look but would also maybe make them pop a bit – so I might investigate that. 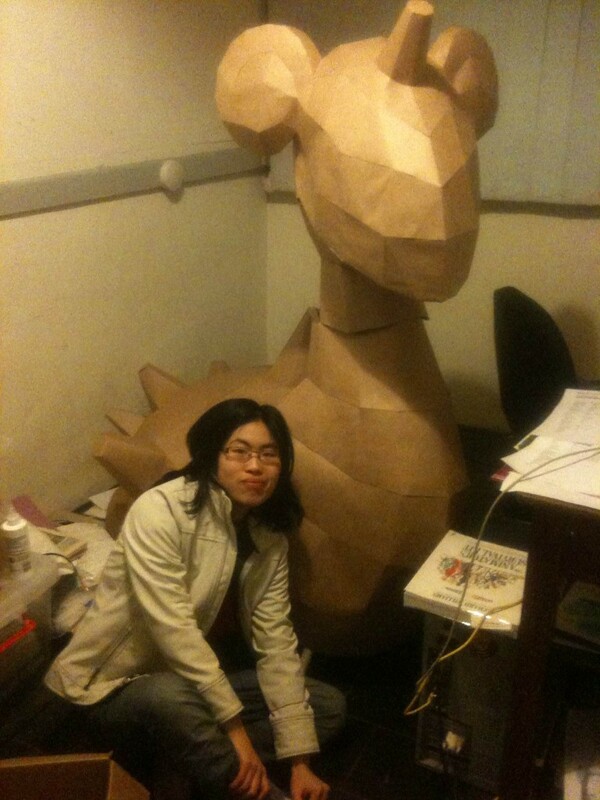 how do you make them so big and what kind of paper are they made out of? 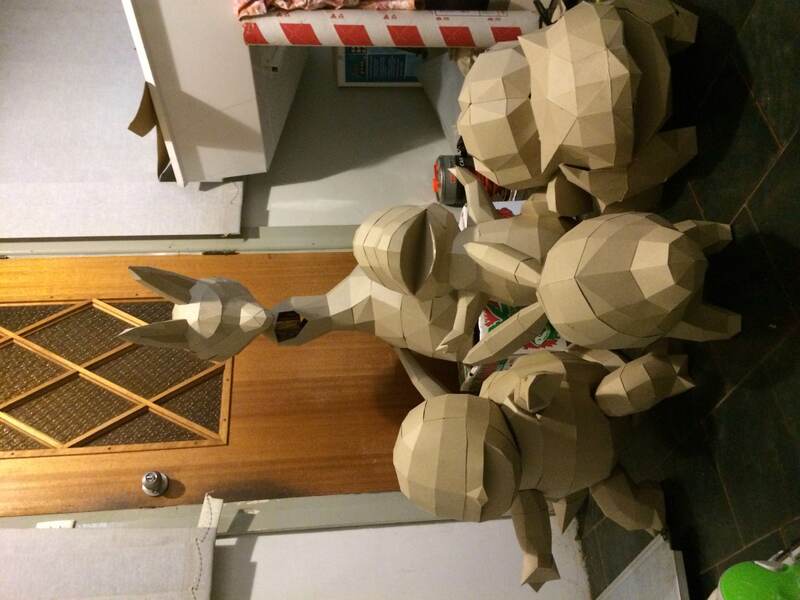 To make them big, I just take the original papercraft models from pokemonpapercraft.net and scale them up! I am fortunate as I don’t have to create the templates myself, but that’s something I want to experiment with soon. Most of these are made out of cereal boxes. 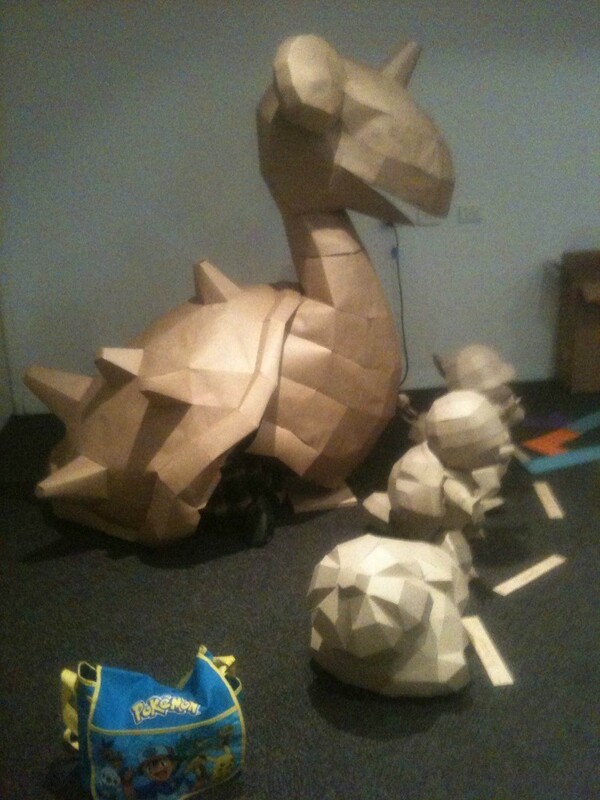 The Lapras is made out of a light cardboard called brown craft paper. It’s about 200gsm and normally gets used by artists as a cheapish drawing surface – I had to buy it at the art shop connected to a fine art school. Some other art shops I visited didn’t have it. That said, I much prefer using cereal box cardboard. So do you print them or do you have to measure them one by one? I print them onto the cardboard when possible, though my printer detests me feeding the cereal boxes into it! For the Lapras, I had a friend with access to a large-scale plotter print the templates onto A0 paper. I then pasted them onto the cardboard. você pode enviar para mim os modelos já com a escala real?